Back to E&E News index page. This story was updated at 2:30 p.m. EDT. The Federal Energy Regulatory Commission is working with Trump administration officials at the Department of Energy and National Security Council to identify which power plants are "critical" to the power grid, FERC Chief of Staff Anthony Pugliese told a nuclear industry group this week. What the agencies come up with is expected to make its way into a controversial White House plan to use a wartime statute and a national security rationale to subsidize struggling coal and nuclear plants. "We are working with DOD and DOE and NSC to identify the plants that we think would be absolutely critical to ensuring that not only our military bases but things like hospitals and other critical infrastructure are able to be maintained, regardless of what natural or man-made disasters might occur," Pugliese said, according to audio of remarks before the American Nuclear Society shared with E&E News by Rod Adams of Atomic Insights. For a second time — following an interview with right-wing publication Breitbart last month — Pugliese criticized New York and its Democratic Gov. Andrew Cuomo for exercising their authority to block natural gas pipelines. And he suggested that pressure be brought to bear on Senate Majority Leader Mitch McConnell (R-Ky.) to speed confirmation of a third Republican on FERC, as soon as President Trump proposes a nominee. The public comments by the former White House adviser are unusual for a top staffer at FERC, an independent, quasi-judicial regulator of power markets and natural gas pipelines. Typically staff plays a crucial supportive role inside the agency to advance the chairman's agenda. But in recent weeks, Pugliese has staked out positions on several issues on which his boss, FERC Chairman Kevin McIntyre, and other commissioners have not spoken publicly. Perhaps most significantly, Pugliese provided a window into how the Trump administration is advancing a plan to force coal and nuclear plants slated for closure to stay open — a clear political priority for Trump. Part of that proposal, a draft of which was leaked in June and is being led by DOE and NSC, involves coming up with a list of power plants that provide critical support for defense installations (Greenwire, June 1). Pugliese said FERC is actively looking for ways to "value resilience" and ensure that "baseload" 24-hour-a-day generators are kept in business. That signals support for Energy Secretary Rick Perry's push to assist coal and nuclear generation threatened with retirement. The five-member commission, under which Pugliese serves, has already rejected a similar plan. "It is incredibly important to the national security of the United States that we ensure that some of these critical assets like these nuclear plants do not go the way of the dodo bird," Pugliese said. "I think it's something that my staff, [McIntyre], [Perry] and the president are interested in seeing come to fruition," he said. DOE has argued that aging coal and nuclear plants, many of which are financially struggling because wind farms and natural gas generators produce cheaper electricity, are vital for security and reliability in the event of disaster. That claim has been challenged by energy experts and grid operators who point to surpluses in the nation's generation capacity that give grid operators time to address major threats to the security and reliability of regional systems. A large part of the justification for action by DOE has been an argument that natural gas infrastructure is particularly vulnerable to attacks, including physical and cyberattacks, compared with coal and nuclear plants. Pugliese's comments this week echoed that as well. "Nuclear is essentially impervious to [electromagnetic pulses] and cyberattacks, whereas you have a number of other assets [and] part of the bulk power system that are incredibly vulnerable. More and more, you have adversarial countries ... who see pipelines, for example, as an area of great opportunity, let's put it that way," he said. His formulation for grid defense — protecting against all natural or man-made disasters — seems to imply an immense investment in grid assets and backup capacity far beyond anything that FERC commissioners, or Congress or prior White House leadership, have proposed. Ensuring power flows against all hazards would not only require protecting power plants, but also the entire transmission network, without which there is no electricity supply, experts note. 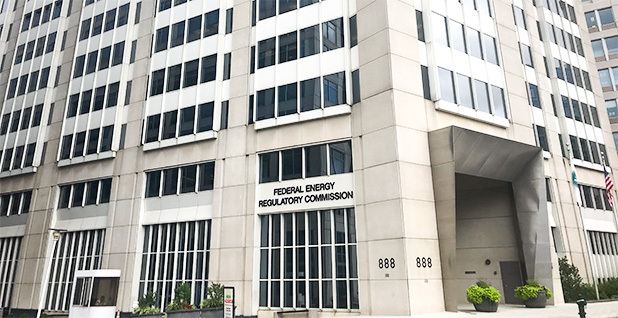 A FERC spokesman said Pugliese was "simply stating that the federal government is working to ensure that important critical infrastructure, like hospitals, remains operational." "FERC is an independent agency and therefore has not assisted in the development of policy but provides technical assistance as subject matter experts," said Craig Cano. Pugliese also stepped on a political third rail in response to an audience question, saying that FERC is looking to expand its authority. "If we have a FERC that doesn't have the authority to tell the states to handle things, to ensure that the winner that we pick is the American people, so they have not only affordable but reliable, available, economical and clean energy, then what is the FERC's purpose?" the questioner asked. "We are currently working with the House and the Senate — I say we as in the administration, the White House and the FERC — to consider what legislative changes may need to take place to ensure that we have the ability and the authority to do just that," Pugliese said. He did not elaborate, but the chief statutes governing FERC are the Federal Power Act (FPA) and the Natural Gas Act (NGA). Neither has been revisited by Congress despite extensive changes in how the electricity and natural gas industries operate. The FPA was last amended as part of the Energy Policy Act of 2005, and the NGA has not been changed since 1962. Earlier, Pugliese had criticized the state of New York over its opposition to several natural gas pipelines. "I'll pick on New York because I enjoy doing that," said Pugliese, a top staffer at an agency chartered to treat all parties evenhandedly. "It can be very frustrating from my perspective, from FERC's perspective, from the administration's perspective, when you have states who are unwilling to — they have no desire to put infrastructure in the ground regardless of what it is," Pugliese said. And he said that FERC is eager to see a replacement for Commissioner Robert Powelson, who is leaving FERC this month to serve as head of the National Association of Water Companies. "We are currently waiting for the White House to nominate our third Republican, our fifth commissioner, and we are very interested in seeing how fast the Senate could possibly confirm that individual," Pugliese said. "I would ask members of the House and Senate to put pressure on [Mitch McConnell] to file cloture to try to get our fifth commissioner confirmed as soon as possible," he said. Alison Silverstein, who was a senior policy adviser to former FERC Chairman Pat Wood III, said that chairmen and their chiefs of staff have historically been apolitical. "FERC chairs prefer to issue orders that have strong policy rationale, solid legal reasoning and unanimous or strong majority votes, to provide regulatory certainty and survive judicial appeal. To get those orders, a chairman does not publicly pontificate on contentious policy issues before they are resolved, especially if he lacks two more votes for his position," Silverstein said. "Prior FERC chiefs of staff support the chair and agency with bland public statements that support the chairman's broad priorities without reducing his options or ticking off other commissioners or members of Congress," she said. "Mr. Pugliese might find that bland is less fun but more helpful to the chairman and his policy agenda." Start a free trial now. Get access to our comprehensive, daily coverage of energy and environmental politics and policy.